Just Call Me Ruby: Bill Oddie's Knitting Sweater and The Knitting Song! I just couldn't resist sharing this amazing knitting pattern I unearthed today whilst sorting through box after box of stuff. 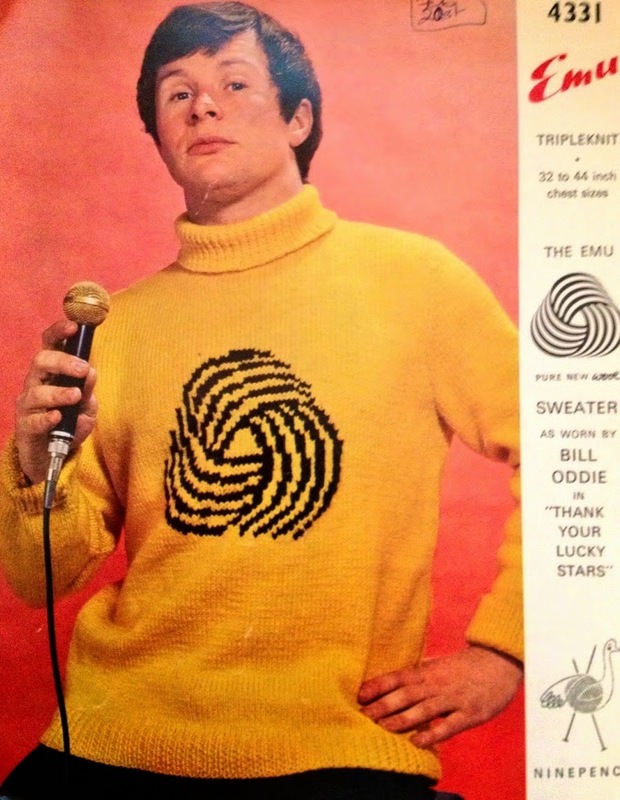 This is the Bill Oddie Knitting Sweater pattern. Knitted in EMU wools 'Tripleknit' a pure wool yarn and featuring the pure new wool logo proudly on the front. If any one doesn't know Bill Oddie, he was one of a trio of comedians known as The Goodies who graced the screens of the BBC for many years combining slap stick, general silliness and songs. The other two Goodies were Tim Brook Taylor and Doctor Graeme Garden. There is still an official Goodies fan site and for anyone who wants a true taste of just how great the Goodies were/are, the BBC are apparently showing an episode from the show on Saturday night as part of the BBC 2 birthday celebrations. K 24 (26, 29, 31, 34, 36, 39) A, 1B, 1A, 1B, 1A, 2B, 1A, 2B, 5A, 2B, 2A, 1B, 1A, 1B, 3A, 1B, 2A, 2B, 25 (27, 30, 32, 35, 37, 40) A. Something that really is quite simple suddenly seems quite complex and long winded when written out like this. Ha! And dare I say that I half like the song? I love the song! Thanks for sharing the pattern too - would not have recognised Bill Oddie if he hadn't been named. He's had much more facial hair in recent decades, surely? Glasses too. I worked for Emu Wools design office back in 1986 and had to read those patterns out verbatim so they could be checked for typos - had to beat watching paint dry as the dullest task ever!! I would never have recognised that as Bill Oddie, and I love the Goodies! How different he looks. Do you have many more celebs lurking in your pattern pile? Oh I know that feeling only too well Caroline! But it has to be done. Whereabouts was Emu HQ? That song also appeared on the radio show "I'm Sorry I'll Read That Again", a sort of joint forerunner to Monty Python and The Goodies and quite a lot of other comedy. Among other highlights was the Julie Andrews tribute song.